This is a general update on a previous piece about bike-share systems and Georgia’s need to get in on the action. Georgia’s first bike-share system isn’t quite as successful as planned, but Savannah officials are poised to make needed changes. Bike-share systems have become widely popular throughout the country, including in many large cities such as New York, DC, and Boston. The concept is simple: place bicycle stations throughout the city and let users rent bicycles from one station and return them to any other station. Users can pay by the hour or purchase weekly or monthly passes. While other systems have largely been successful, Savannah’s has struggled to gain traction with the system selling only 629 passes (as of April 2014) since its launch in January 2014. Fortunately it is believed that the lack of ridership has less to do with a lack of interest and more to do with the expansion and placement of stations. 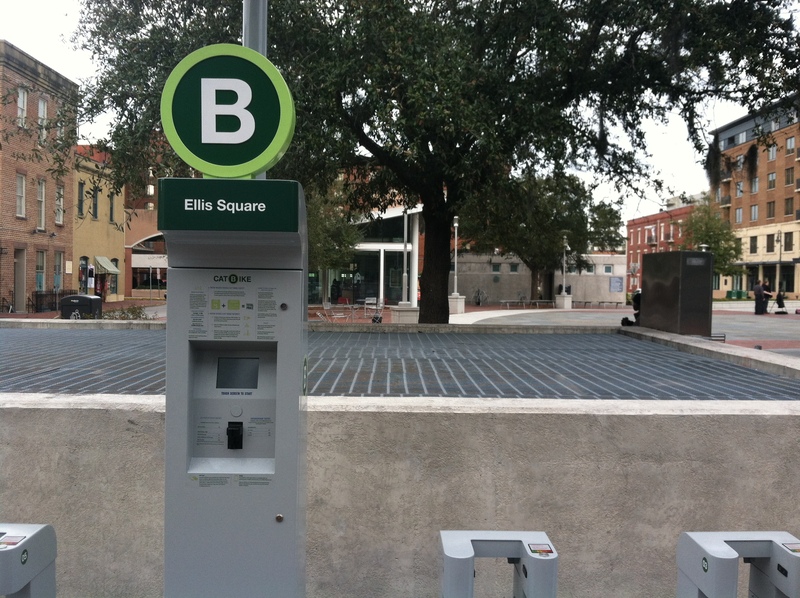 The current system has but two stations: one at the downtown transit center and one at Ellis Square. Realizing the lack of stations and bikes (just 16 total! ), Chatham Area Transit (CAT) intends on further expansion to accommodate more users. The cities with successful bike-share programs know that an abundance of stations is critical. In order for such a system to be beneficial, bicycle stations must be located close to population centers and significant destinations. It must cater to people that are staying in hotels and traveling all around downtown as well as residents who need to do daily errands. This means that stations must be abundant. In the previous article it was noted that Savannah is an ideal location for a bike-share system. The narrow, shaded streets of the historic district make bicycling fun and safe. Unlike Atlanta, with its neighborhoods spliced by busy thoroughfares, historic downtown Savannah is an idyllic location. In this sense, downtown Savannah is much more like New York and DC because it provides cyclists with safe and consistent traffic volumes and road conditions. New York and DC’s systems have been wildly popular. Washington DC’s Capital Bikeshare has over 300 stations in DC, Arlington, and Alexandria and recorded over 1.8 million trips in its second year of operation (2012) with a record 15,000 daily trips occurring on April 12, 2014. New York’s Citibike program launched just last fall and recorded over 3 million trips in it’s first three and half months. The evidence shows that when conditions favor biking, users will arrive in droves if adequate facilities are created. Fortunately for us, Savannah is learning from others by expanding resources and facilities and should become another great American bicycling community. On a humorous, but also serious note, Casey Neistat did a great video on the hazards of bike lanes (below). Even though cities install dedicated bike lanes, they can still be hazardous because the rules that protect the lanes are either not enforced or are wrongly enforced. Since bike lanes are new, many police officers are unaware of the rules regarding the lanes. This means that officers issue tickets improperly (as witnessed in the video). Many police officers regard bike lanes as secondary to driving lanes when the same rules that apply to driving lanes also apply to bike lanes; trucks, people, and general obstacles are not supposed to be blocking them. Police are often unaware of those and other rules that apply to bike lanes solely because bike lanes are a relatively new concept. More advocacy is needed to instruct police about a subset of laws that is just now becoming relevant. If you get a ticket for bicycling, please figure out if it is a legitimate violation before paying.